View 3 months at a time. Great for planning. This calendar has your large imprint at the top. 12 sheets. Price good till May 31, 2019. Minimum quantity 50. Quantity variation +/- 4% is possible & billable. 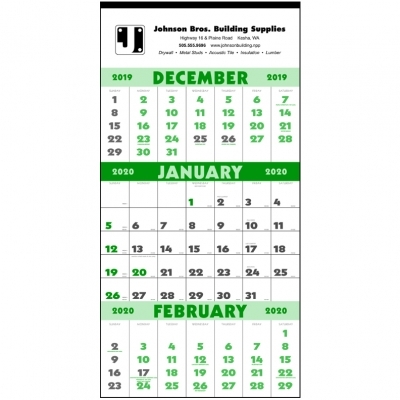 A very useful wall calendar because it shows 3 months at a time. It has a large ad space. There is room to write in daily appointments. The center grid has Julian dates. Tinned at the top to hold its shape. The green imprint area matches pantone 349 green. Imprint size: 11 1/2"w x 3 1/4"w. Standard imprint color: Black. Price includes straight lettering in black, or customer-supplied vector line-art.